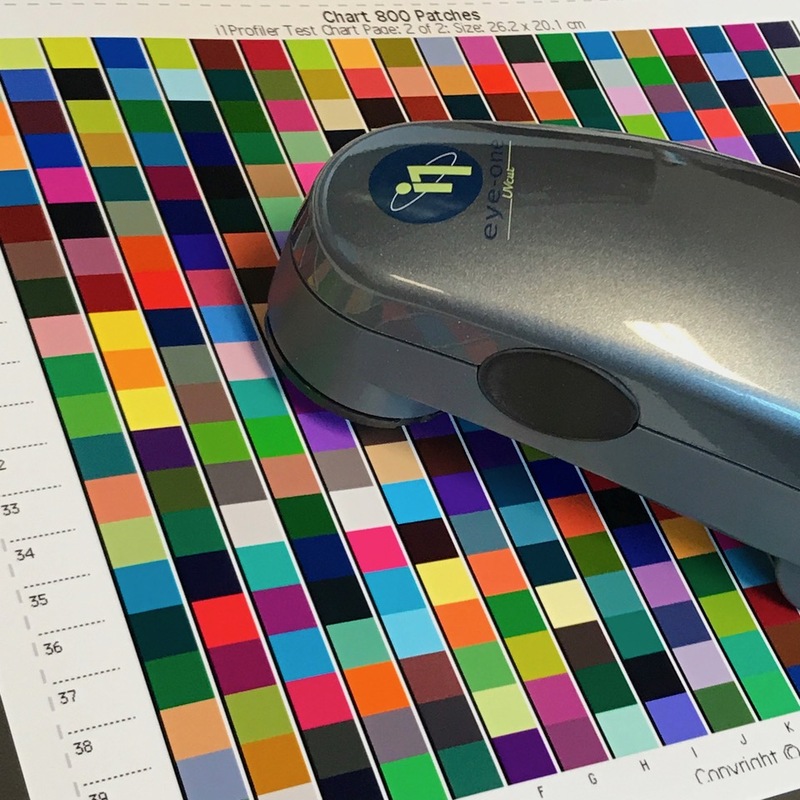 Getting the color out of your printer to match what you see on screen is the job of your color management system. Both Mac OS and Windows have built-in color management systems to enable this, along with the apps you use for photography. 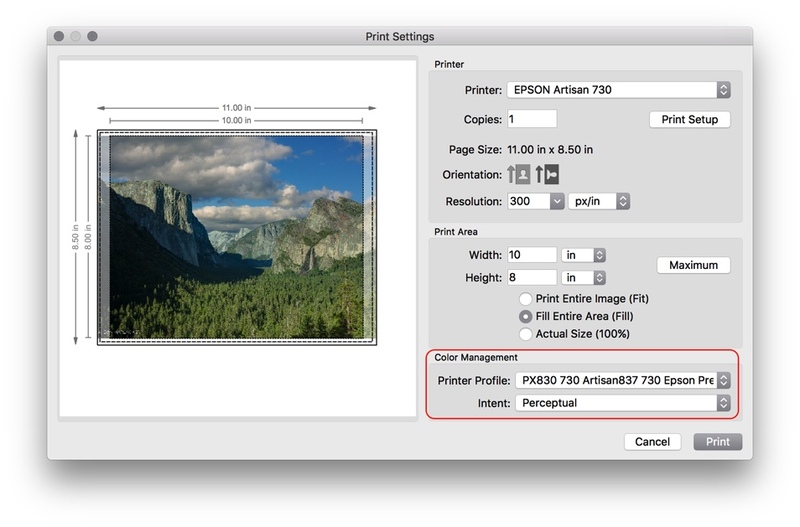 In order for color management to work properly, you need a profile for each of your devices. The profile acts like a fingerprint for the color for the device. The color management system uses these profiles to translate the color interpretation of one device to another. In this latest post I explain how color management works inside of ON1. I created a downloadable PDF of this post so you can have it handy for later. Download here. First, lets start with the files you create. These days most files are digital captures from your camera or phone. Most of the time these use a very- common profile known as sRGB. However, most advanced cameras can be set to capture in Adobe RGB also. Both of these profiles are known as color spaces. They are generic profiles containing lots of color information vs. actually describing the capabilities of a camera. 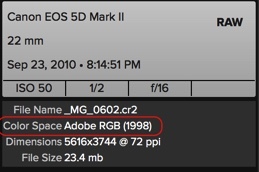 When given the choice, I recommend choosing Adobe® RGB instead of sRGB. It’s a larger color space which will preserve more vivid colors in your photos. There are also tools available to let you build custom profiles for your cameras so they record colors more accurately to a scene. These tools are great for commercial photography to match the exact color of an item, like apparel. At the moment, ON1 Photo RAW 2017 doesn’t support assigning custom camera profiles. When you create a new document in ON1 Layers, the color space used is set in the preferences dialog. 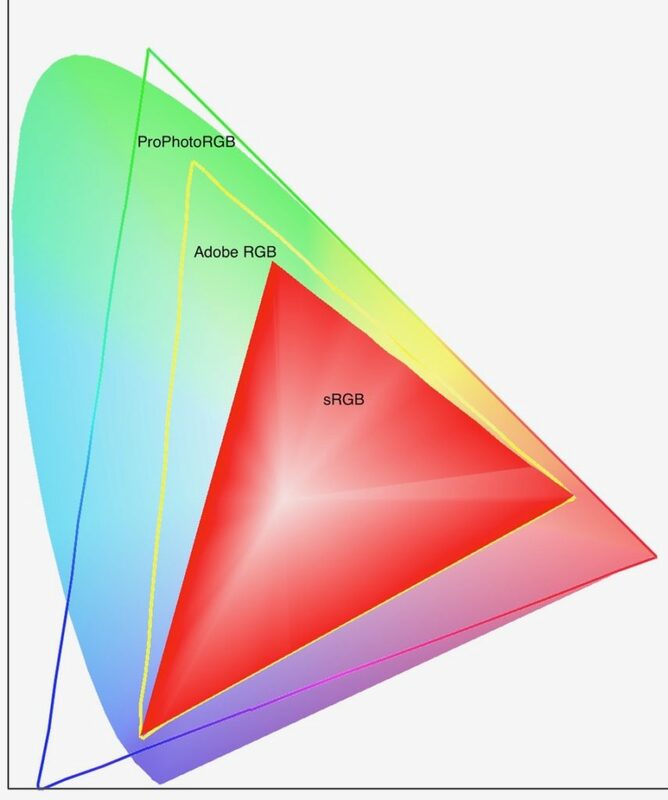 Again, for most customers Adobe RGB is an excellent choice. When you view or edit a photo in ON1 Photo 2017, they are placed in ProPhoto RGB (aka ROMM RGB). This a giant color space containing most all of the colors in sRGB, Adobe RGB, and just about any other colors. Working in ProPhoto allows you to do two main things. Maintain all of the original color and to make changes in the the most vivid colors to maintain the color details. Raw photos are opened directly into Pro Photo so you maintain every bit of color. Getting your displays to accurately show the colors in your photos is probably the most important part of color management. It’s your window into the photo. It’s what you use to make judgements about tone and color. If it isn’t showing the photo accurately, then you will make false judgements. Fortunately, getting your display to show accurate is easy. It requires a tool called a colorimeter or spectrophotometer. These also come with software to build a custom profile for your display. X-Rite and Datacolor make affordable tools for this. Remember, the display profile is set at the operating system level and is used by all applications that support color management. So there isn’t a need to set this profile in your apps. When you are done editing photos you will likely export copies for sharing or delivery to your lab or clients. When exporting, you can select which profile you want your photos saved in. This choice is generally dictated by where they are going to end up. For example, JPG photos you export for websites or social media should be in sRGB. If you are sending photos to a photo lab, it will depend on their requirements. 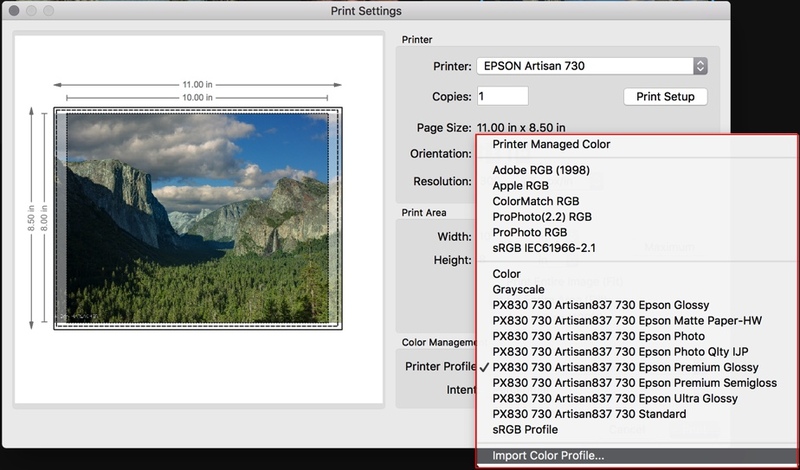 Most labs will use a common color space like sRGB or Adobe RGB, but some may use a custom profile for their printing equipment. You can import a custom profile in the export dialog. When you export, it is the job of the color management system to translate or “squeeze” the color of the photo down to fit in the exported color space. This is done in a way to try and maintain the relationship between colors so you don’t see any large changes in color in the exported photos. Some applications offer soft proofing also. This lets you simulate on your display what the exported or printed photo will look like. ON1 Photo 2017 doesn’t currently offer this, but it is a common request and you can vote on this feature here in the ON1 Photo Project. If it gets enough votes or feedback, we will add it. Printing is where color management is really really important. Each printer and paper combination needs a profile to describe how it reproduces color. Today, most printers come with pretty good profiles for stock papers. However, if you use different papers or are looking for a perfect match to your monitor you will need a custom profile. Similar to the tools we use to build a profile for our displays, there are also tools for building profiles for our printers. Again both X-Rite and Datacolor make tools for this. You basically print out a series of color swatches you will then measure with a tool called a spectrophotometer to build a custom profile. These custom profiles can then be imported into the print dialog. It is also really important you have the correct printer driver installed on your computer. Often times the operating system will install a generic driver, like AirPrint, so you don’t have to download and install one. It’s important to remember these generic profiles don’t include all the options or profiles needed for high-quality printing. Configuring the printer driver and the print dialog to work together is often confusing and a point of failure when it comes to printing. I’ve included the steps I use for my printer which can also be used as a starting point for your printer. Configure the printer driver by clicking the Print Setup button — You need to select the correct paper type, print quality and most importantly, turn off the printer color management. 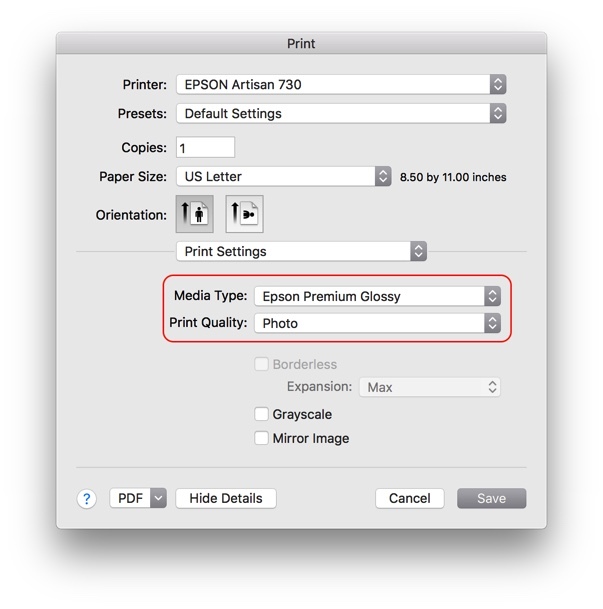 Press the Save button in the print driver to return back to the Print dialog. Set the Printer Profile — Built-in profiles for your printer will be displayed here. Can can select one of these, or import your own. If you don’t see the built-in profiles here, either your printer doesn’t come with any, or you don’t have the correct driver installed. Last set the Rendering Intent. This controls how the colors will be squeezed down to fit in the relatively small range of colors your printer can print. As a general rule, if you are printing a landscape photo, use Relative Colormetric. If you are printing a portrait, use Perceptual. If you can’t decide, go with Perceptual. Okay, that’s it. You now have pretty much everything you need to get accurate color from start to finish in ON1. Happy editing and happy printing! Thanks for the PDF, and yes, quite a few of us would like to have soft proofing available in Photo Raw. i have a pc with win10, on1 photoraw, photoshop+lr CC and a canon mp980 200 euros which becomes old and not supported very well by win10. i am looking for a new printer which has possibility to let photoshop+on1… manage color. i have limited budget. a4 is enough for me but could perhaps afford a 600 euros a3 printer. do you have some a4 and a3, epson and canon, below 700usd to advise ? xp-760 a4 and scp-600 a3 and canon pro-10s. I have been very unpleased to see my ON1 Photo RAW 2017.6 crashing at start, just after I used my X-RITE Colormunky Display color probe to generate a ICC profile for my screen. I pretty sure that it’s not a normal behavior. I also seen on the dpreview forum that other people experienced the same problem when changing their display ICC profile.